Hey there, Party People. About twice a day I think, “I should do a blog post on that.” For example, I’ve been learning a great deal about the difference between writing comics and prose. There are at least four articles right there. Also, we’ve been pet-sitting a gecko, and I have a long treatise on how geckos are the pot heads of the pet world. Gecko 1: Dude, you know what would be great right now? Gecko 1: We should get — what are those things we eat? Gecko 2: Those crunchy things that hop around? Gecko 1: Right. We totally need some of those. Man, what are they called? They make those cricket noises. It starts with a K…. Gecko 1: Dude, this rock is so warm. Actually, the keep dracula in a much more sanitary cell than this. 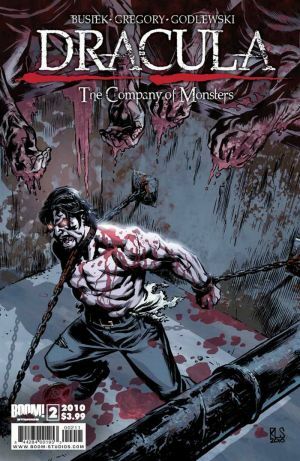 Dracula: Company of Monsters #2 is on the stands now, but you take a look at this six-page preview. I’m fond of this issue because I got to kill off the fictional equivalents of Dhawal and Rovil, two interns who worked at my day job over the summer. They’re both great guys, and Dhawal especially is a huge comic book fan, so when I needed a couple of people to knock off, I drafted them. They seemed really happy about this. Though it could be that as interns they were just trying to get a good grade. THIS JUST IN: For the second issue in a row, the hero of D:CoM, our corporate lackey Evan, is one of the Heroes of the Week over at the comics blog, Awesomed By Comics. Every week, Evie and Aaron pick their favorite covers, favorite heroes and villains, and clunkers of the week, and Aaron’s been digging how Evan’s a schlub trapped in a horror comic. As a bonus in this episode, one of my best friends in the world, and ex-college roommate, JR Jenks, gets a shout-out in the first few minutes of the latest podcast for his righteous prank on the hosts. If you’re a comic geek, why aren’t you subscribing to them? They do delicious banter, avec kittens. In prose news, my first novel, Pandemonium, sold to a publisher in Brazil, so there should be a Portuguese version coming out eventually. I got an email from someone at Random House saying “CONFIDENTIAL” on it, so please, don’t tell anyone. Oh, and some reviews. The New York Review of Science Fiction ran a very kind review by Greg Johnson that appeared in the table of contents as “Daryl Gregory’s Continuing Brilliance.” See, that’s all I really want from a critic: blunt, unvarnished praise. And over at Strange Horizons, they often do this cool thing: they run two reviews of the same book, side by side. Well, top and bottom, actually. Back in July Michael Frogatt and David Schwartz reviewed The Devil’s Alphabet. They’re fairly positive reviews (and I can hardly complain when Schwartz says things like TDA is good verging on great, which I’ll take any day of the week). Throughout The Devil’s Alphabet Gregory presents theories to explain TDS, some more or less scientific, some metaphysical, without ever settling on one explanation. Given his deftness in portraying the relationships in the book, and the subtlety with which he handles the mystery of Jo’s death, it’s possible that this is intentional; some mysteries cannot be solved, some of us will never really know ourselves. Or perhaps he’s suggesting that the two are connected in some unstated way—perhaps Pax is a conduit of some sort, a catalyst or a carrier. This is the risk of subtlety when you’re a relatively new writer. Not having read Gregory’s widely praised debut, Pandemonium, I haven’t yet built a relationship of trust (or lack thereof) with his work; I can’t say whether I think he’s leaving questions deliberately unanswered, or if he’s leaving them hanging because he’s not sure of the answers himself. This is a really interesting comment, because sometimes it is a matter of trust between reader and writer. Is the writer doing this on purpose, or did they just lose control? For example, when I’m reading a Gene Wolfe short story, I’m pretty sure that I’ll never know exactly what the hell is going on — not on the first reading, and probably not on the third, unless another Wolfe, the critic Gary K, explains it to me. That’s just part of the deal with Wolfe, and you know it going in. Read an Iain Banks novel and you know that there’s probably going to be some deep structure to the novel that is almost obscured by the space opera fizz, and that when you finally visualize the structure, the novel will snap into place and become something entirely more substantial and beautiful. But if some student new to writing attempted that much fizz, or embraced that much ambiguity, you’d tell them to straighten up and learn to tell a story. I talked a little about this in a previous blog post titled To Explain or Not To Explain, but think I’m attracted to those kinds of partially unresolved stories because I’m more interested in the effects of strangeness, on people and on the world, than in explaining the strangeness. Maybe this is because a lot of time the world doesn’t make much sense to me. I rarely feel like I’m getting the Final Jeopardy answer. I mean, we still don’t know how gravity works. We don’t know why we are conscious. And no one can explain how Jimmy Kimmel is still on television. Masked, the anthology of superhero short stories, continues to get good reviews around the internet, including this latest one, which is pretty much a non-stop rave. Thanks, geeks! We’re happy to serve. Okay, I don’t make any music. But today I’ve been digging on mashups by the DJs Hood Internet. I recommend. ← Remember reading? That was great, wasn’t it?